Hybridization is considered to play an important role in speciation and evolution. Given the predicted northward tree migration in the eastern USA due to the impact of climate change, hybridization between related species is expected to become more frequent due to overlapping distribution ranges in the future. 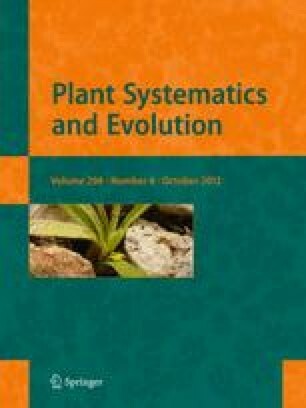 Oak species are “hot spots” of contemporary hybridization, serving as model organisms in the development of ecological species concepts. Q. rubra L. and Q. ellipsoidalis E.J. Hill were selected as study species, since they show different ecological requirements but hybridize with each other where both species co-occur. To identify morphological species and differentiation patterns in this species pair in ten populations on the Upper Peninsula of Michigan we investigated both leaf morphological variation, and genetic variation at highly variable microsatellite markers. Cluster analyses using leaf morphological characters revealed two distinct clusters for directly measured leaf characters and three clusters when additionally leaf shape characters were considered. Two populations growing on dry and sandy sites and identified as Q. ellipsoidalis in the field and by genetic assignment analyses were differentiated from the other eight populations at leaf morphological characters. Strong and significant correlations of leaf morphological differences with genetic distances at microsatellite markers but not with geographic distances are consistent with a pattern of isolation by adaptation. Differentiation at genetic and leaf morphological characters between neighboring populations in contrasting environments suggested reproductive isolation between populations of different species, possibly as the result of divergent selection. More extensive sampling along the distribution range of both species and reciprocal transplant experiments between parental environments are necessary to better understand the role of interspecific gene flow and selection in the maintenance of species identity in red oak species (Quercus section Lobatae). The online version of this article (doi: 10.1007/s00606-012-0656-y) contains supplementary material, which is available to authorized users. We would like to thank James Schmierer for his help in identifying stands in the Baraga Plains and in sample collection, and Dr. Kerry Woods for his help in the identification of Q. rubra populations in the Huron Mountain Wildlife Reserve. For their help in preparing and measuring the leaves we would like to thank Erin Hickey and Joanna Rogers. Funding for the study came from start-up funds of Michigan Technological University to Oliver Gailing, the Michigan Technological University Research Excellence fund, the USDA McIntire Stennis fund, the Huron Mountain Wildlife Foundation, the Hanes Trust, and the NSF Plant Genome Research program (NSF 1025974). We like to thank two anonymous reviewers for their helpful comments.